IObit Advanced SystemCare Pro 5 is one of the world’s leading PC security, maintenance and optimisation suite which provides an always-on, automated, all-in-one PC Healthcare Service with anti-spyware, privacy protection, performance tune-ups, and system cleaning capabilities. This powerful tool protects PCs from malicious software and hidden Internet threats, fixes stubborn errors, removes clutter, optimizes Internet and downloads speeds, ensures personal security and maintains maximum computer performance automatically. With the advanced intuitive design and state-of-art computer technology, your PC experience will be made truly different. Advanced SystemCare 5 Pro divides its functions into four distinct categories. 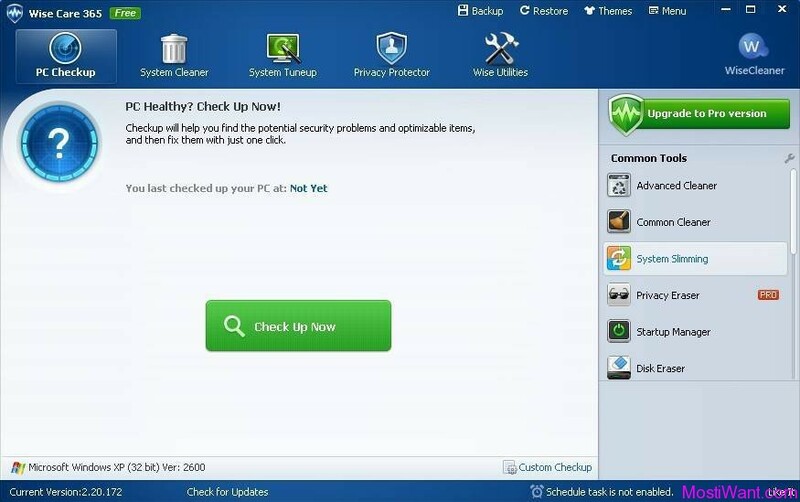 The first, Quick Care performs a series of rapid checks for daily maintenance in a very quickly way; the second, Deep Care provides a thorough analysis of the PC’s state of health and carries out security and vulnerability fixes, tweaks and improvements, defrags the registry and cleans-up junk files; the third section, Toolbox includes a collection of over 20 smart and dedicated system tools found in IObit’s standalone IObit Toolbox program; the final section Turbo Boost, turns off non-essential resources with one-click, delivering even more performance capacity when it’s needed most. Keeps your PC running at peak performance – Fully optimizes Windows for ultimate system performance and top Internet speed by unleashing the built-in power of your system, based on how you use your PC and your network configuration. It turns your PC into a business PC, a productive workstation, an entertainment center, a game machine, or a scientific computing PC. ActiveBoost function for real-time optimization – Active Boost, technology that actively runs in the background intelligently managing system resources in real-time, constantly detecting inactive resources and optimizing CPU and RAM usage. Defends PC security with extra protection – Detects and analyzes Windows security environment. Scans and removes spyware and adware using up-to-date definition files. Prevents spyware, hackers and hijackers from installing malicious programs on your computer. Erases and updates your PC’s activity histories. 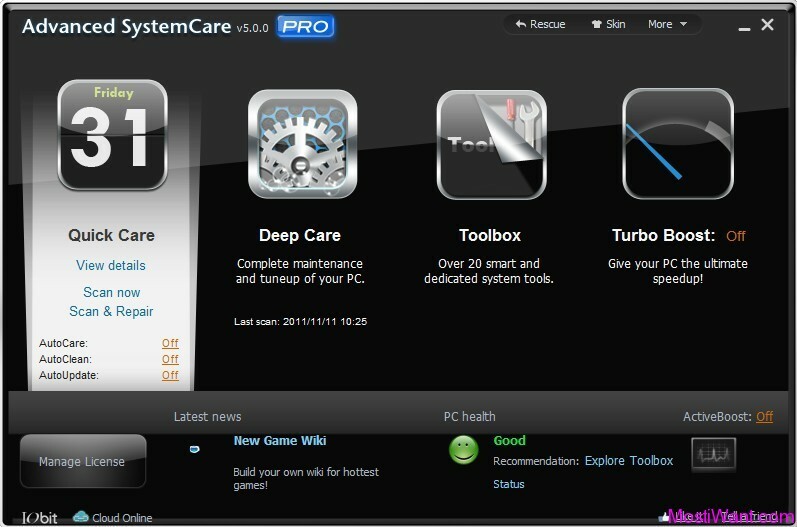 More than 20 dedicated smart tools for everyday PC maintenance – Advanced SystemCare 5 integrates IObit’s latest Toolbox which has more than 20 dedicated smart tools for everyday PC maintenance or advanced needs, including tools for system cleaning, optimizing and repairing, tools for security enhancement, and tools for full control over the system. Ultimately speeds up with turbo boost – Turbo Boost can speed up your PC by shutting down unnecessary background processes, cleaning RAM, and intensifying processor performance. One click to solve as many as 10 common PC problems – Advanced SystemCare 5 inherits the ease-of-use from previous versions, with more powerful capabilities. This time with one click, it scans and repairs ten PC problems and protects your PC from hidden security threats, while V3 only supports eight. The newly added “Disk Scan” and “Vulnerability Fix” helps scan and fix disk errors and Windows vulnerabilities. Next-generation registry deep clean and optimizer – Safely cleans registry junk, compacts registry bloats and defragments the whole registry for maximum performance. Finds and fixes the registry errors that other utilities miss with “Deep Scan” technology. Simpler and Easier to Use.You do not need to be a professional or know much about computers. All you need to do is install it and a few clicks will have you enjoying that new PC feeling again. Advanced SystemCare 5.3.0 was released on a few days ago, with a fresh experience on functions. To promote this all-in-one system utility, we have been provided with 10 free license keys of “Advanced SystemCare 5 Pro” to giveaway to our readers. To win a free copy, simply share this offer on your blog, forum or on any social networking site and place its status URL here in the comments below so that I can verify that you’ve done that. You may use the social widget below, after this post. A valid email address must be entered on the “Mail” field. And do NOT post email address inside comments to avoid spam. The Giveaway will end on Jun 17, 2012, 12:00 PM GMT. 5 winners will be chosen by me and the others 5 will be selected randomly according to random.org, and will be announced (in this post) before Jun 18, 2011, 12:00 PM GMT. Thanks William for organizing such a fantastic giveaway, and to Jessie for sponsoring the licenses. I’ve been waiting so long for any ASC giveaway, thank god it’s finally here. I don’t know why there are so many pointless comments here, it’s hard to find any giveaway with handpicked and stronger chance to win nowadays, since many of them are based on pure luck, especially those giveaways that use rafflecopter and random.org. I’ve been using the free version of ASC for years, so won’t let my only chance to upgrade this awesome system cleaner and optimizer for free to slip away. It’s easy to use with lots of extra tools, clean and simple UI and it doesn’t bog my system down. 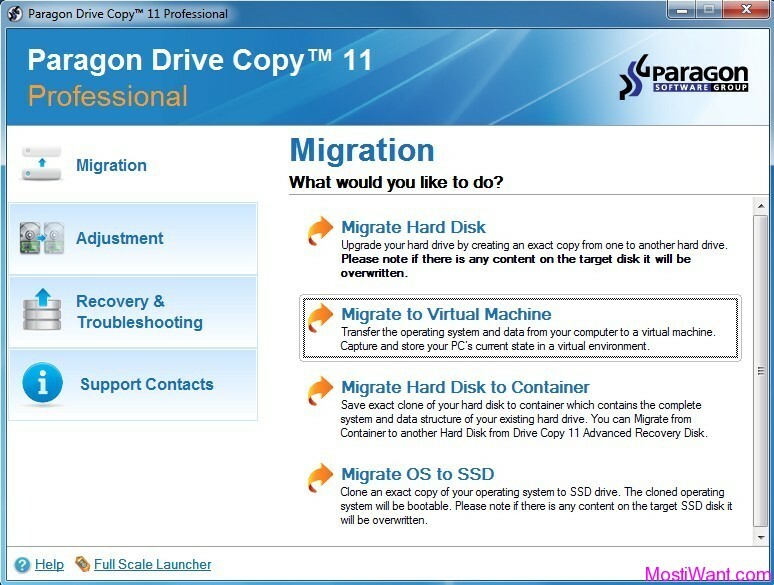 The free version = just a basic PC care utility. It lacks many important features compared to PRO version, such as automatic and schedule functions, as well as deep scan/clean. I haven’t had a chance to use those greyed out and disabled extra tools and features before. Besides, I’ve been wanting to use the additional cool GUI skins in the PRO version for so long. Anyway thanks again the for giveaway, put my name in your winner list and good luck to all contestants. This PC tune up utility (over 130 million worldwide downloads so far) is absolutely the best one on the market along with “Tune Up Utilities 2012” to repair and optimize the HD and registry of your PC. I have been using GLARY UTILITIES and CCLEANER for about 4 years but the last version of this amazing tool has absolutely outclassed both of them. If you use ADVANCED SYSTEM CARE 5.0 you’ll soon realize that is like hiring a PC technician to take care of your system, making the tune up of your system a breeze even if you have no idea how to clean up the registry of your PC. 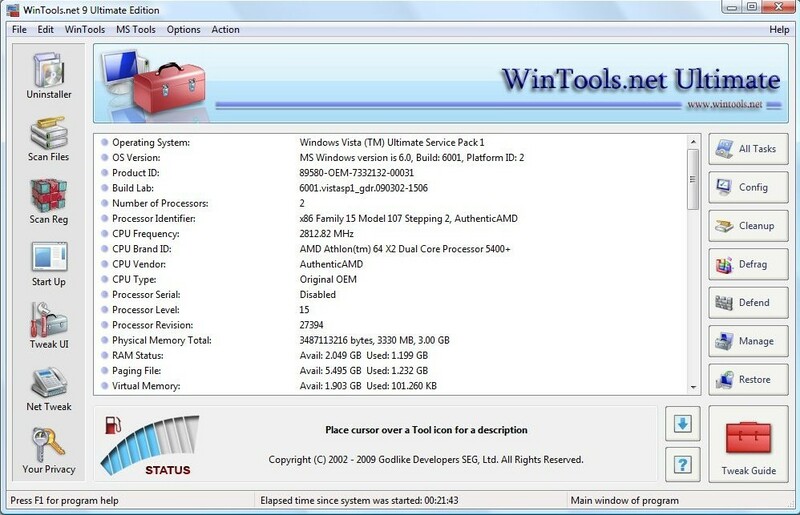 The last version of this stunning program enables you to use several AUTOMATED TOOLS, such as the TUNE UP SYSTEM module designed to increase the speed of your web connection and the CLEAN UP SYSTEM feature for optimizing your windows registry in depth and solve any possible disk errors and Windows vulnerabilities to gain maximum performance. Moreover, the new advanced TURBO BOOST module can now detect and turn off more needless background processes and windows services than ever before, making your system more stable, faster and smoothier. Please count me in your amazing contest!! Thanks a lot!I think IObit Advanced SystemCare Pro 5 is the best one of PC security software! @provn, I am sorry but i do not quite understand what you are meaning. Do you mean that you want to get box version? Hey mister, here’s a long story, but I still can not understand, how I can get this key. Or at all can get? And if so, how long time it is running then? Is this also applies when the new, containing av, what is currently a beta, will be not beta? I would like to receive one license, thanks.